Please sign the letter petitioning Governor Cuomo to maintain access to a high quality liberal arts education to students through our community college. Above is the link to the letter (also to the right in our sidebar), please sign it using your ncc email account. There will be both a confirmation screen and an email indicating that you have signed. Let us remind Governor Cuomo that our community college students, who cannot afford Stanford, have a right to an education grounded in the same liberal arts tradition. Although the governor is motivated by the laudable economic goal of “growing jobs” in New York State, “job training” for employment in local industry without teaching students to think critically will not “make the community college system more rewarding.” It will also not prepare our students to grapple with the rapidly changing technologies of tomorrow. Please join us in this effort to maintain the quality of a community college education, and sign the linked letter that will be forwarded to Governor Cuomo, our state and local elected officials, the NCC BoT, and the SUNY BoT. These are some photos from the NAAC Kick-Off Event on November 24, 2014. These are some of the faculty comments from before and after the NAAC Kick-Off Event on November 24, 2014. 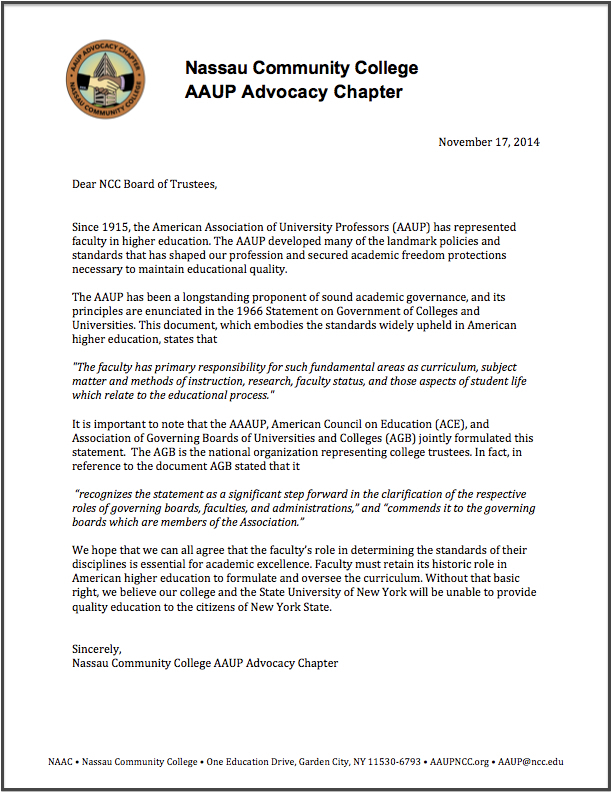 A letter was sent to the Nassau Community College Board of Trustees from the NAAC on November 17, 2014.